Photo: Nathaniel Curry House, ca. 1892, 1458 Quail Lane near Roseburg, OR. 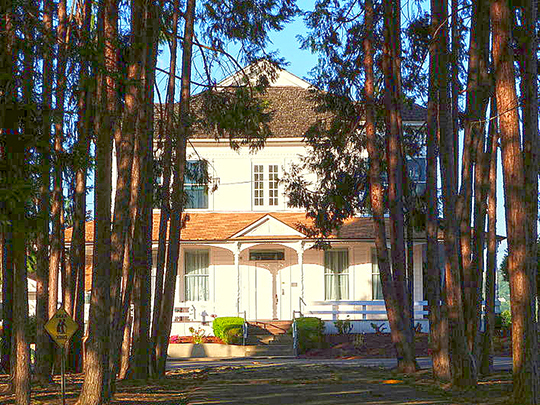 Listed on the National Register of Historic Places in 1983. Photographed by user:Ian Poellet (own work), 2013, [cc-by-3.0 (creativecommons.org/licenses/by/3.0)], via Wikimedia Commons, accessed January, 2014. The Douglas County Courthouse is located at 1036 SE Douglas Street, Roseburg, OR 97470; phone: 541-440-4323. Douglas County was established in 1852 and named for Steven A. Douglas [1813-1861], U.S. Senator and Presidential candidate who opposed Abraham Lincoln in 1860.